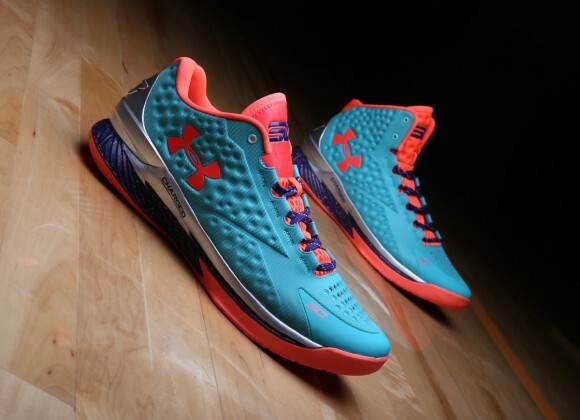 A special PE colorway for Curry’s annual basketball camp makes it’s way to online retailers, as the Under Armour Curry One ‘SC30 Select Camp’ can be found below. Each year, Stephen Curry hosts a camp for Top 20 best high school guards in the nation. From running workouts to studying film to competing on the court, the 2014-15 KIA NBA MVP is side by side with the players every second of the experience. These are the exclusive UA Curry One Lows each player wears while they’re grinding to get better. Additionally, both shoes boast Charged cushioning to absorb impact while providing responsiveness for a quick first step. Further, the AnaFoam upper delivers a snug fit, while still providing a lightweight structure. Refresh the links below to purchase the Under Armour Curry One ‘SC30 Select Camp’ Mid and Low. Aaaaaaand. Gone. Didn’t even take a minute to sell out of this ugly color. 10 A.M E.T and they were sold out. A kind of joke I think. I’m kinda on the fence about these…I did manage to pick up the home and panthers cw’s on footlocker and finishline.com and lemme tell you…absolute FIRE! Anyway maybe you guys should check again, finishline still has my size 10.5 in the curry camp cw…and the shoe may not be sold out because when I checked EVERY website lookin for homes they said they were sold out (when I tried to cop on initial release at 6 am) but when I checked again at 2 pm I was able to scoop me, and boy am I happy! Guys I be been trying to get a curry one every release except the camo colorways and I never managed to get o size 9 in my cart I eventually managed to get a pair from kicks.com (Europe) .